Scolmore’s new 20A 3 and 4 Pole Fast Fit Flow Connectors feature push-in, low maintenance terminals to offer a time-saving benefit for the installer, with no screws required. 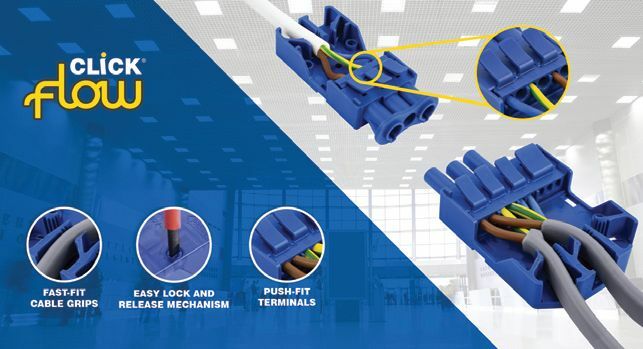 In a speed test carried out by Scolmore, the installation times were compared for their new fast fit connectors, versus the equivalent screw terminal version and typically the fast-fit versions were completed in around half the time. The new product launch comes after the results of a recent survey carried out among more than 400 electricians revealed that 33% prefer lever type wiring connectors and that over 50% would be willing to pay a premium for a fast-fit connection method. The new range will be compatible with all current Click Flow products – connectors, splitters, distribution boxes and ceiling rose. They are simple to install in just a few quick steps. Allowing installers to safely connect/disconnect luminaires or appliances in areas that require quick installation and regular maintenance, the new fast-fit connectors will be suitable for a range of applications. Scolmore’s Flow Connector range makes the wiring of a lighting circuit easy, using a combination of connectors, hubs and management boxes. The unique design of the Flow Connector products prevents the possibility of incorrect polarity connection, which is a problem with other similar products that are making their way into the market. For further details visit www.scolmore.com, email sales@scolmore.com or contact Scolmore on 01827 63454.